When it comes to cycling, it is a very subjective decision that needs to be made when you are deciding on what pedals to purchase. The majority of the high-end mountain bikes are not sold with pedals because they are so specific to the rider. Usually, there is a preferred brand or model used by a rider, and this could be the case for you, too. With technology advancing all the time, pedals are also advancing as well, so a brand of the pedal which may have been perfectly suited for you once upon a time may now have been pipped to the post by another brand. To help you make the decision as to what type of pedal could assist you in your mountain biking, we have put together our list of the top 10 best mountain bike pedals in 2019 for you to consider. Related: Mountain bike tires & MB lights. Created from Nylon composite, these pedals are available in a wide color range. Designed with comfort in mind, they are also waterproof, dustproof and anti-slip. They have been innovated through the use of a chromoly steel axel bearing keeping the pedals stable, increasing pushing power and enhancing pedal life. The FOOKER pedals are larger than average pedals providing the rider with a larger surface area to grip, a safer ride and a more comfortable cycling experience. They’re easy to install and can be fitted to the soles of the cyclists’ shoes for maximum grip and security. At 9/16 inch, these pedals also have an anti-skid nail fitted within them increasing the friction between pedal and shoe, decreasing rider slipping risk and increasing safety. These are great pedals for a wide variety of different cycling styles with riders resting assured that they have made a great pedal choice with 3 years warranty. Why We Like It – We like the FOOKER MTB Bike Pedal Nylon 3 Bearing because they are so comfortable and safe for cyclists to use and are not restricted to specific widths of the shoe. 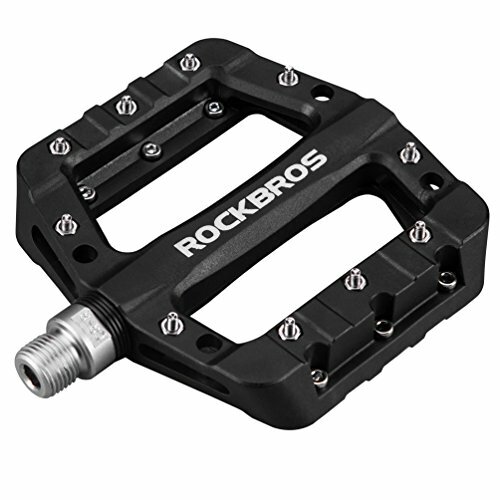 With four different color options, the RockBros Nylon Fibre pedals have a rugged surface to assist gripping. They’re hardy, durable, shockproof, abrasion and corrosion resistant, all of which enhance pedal life. They are strong and have anti-skid nails embedded within them to stop the rider from losing grip, especially useful in wet or muddy conditions. 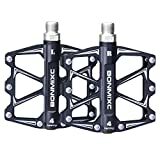 These pedals are a great lightweight option, important to consider if you’re mountain biking and they are wider than average giving greater pedal area and power. 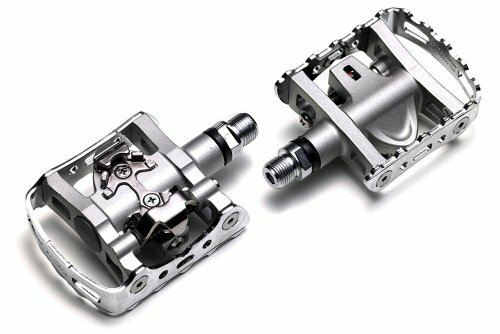 Weighing less than one pound, these attractive, ergonomically designed pedals have been created with long rides in mind, performing well, comfortably and efficiently, through the use of high-speed DU bearings. They are easy to install and are fully sealed pedals preventing any dirt and debris from building up within them which may cause noise, technical or safety issues. These pedals can be used on just about all bikes. Why We Like It – We like the RockBros Mountain Bike Pedal Nylon Fibre because they are so safety conscious, ideal for wet, muddy and slippy conditions when cycling challenging routes with no slip risk. Available in solid black or in many different, two-tone combinations to add color and personality to your bicycle. These pedals are a smooth, lubricated sealed bearing pedal with anti-skid pins preventing the cyclists from slipping and increasing cycle safety in challenging conditions. This enables cyclists to ride and race in better, more efficient ways. The Mzyrh pedals have an anti-slip cleats design, enabling cycling shoes to grip well to the pedals, and they are incredibly lightweight, weighing just 0.45 pounds. To encourage efficient pedaling and to increase the power created when pedaling, anti-slip nails have been created from aluminum, keeping them lightweight, sturdy and good for grip. 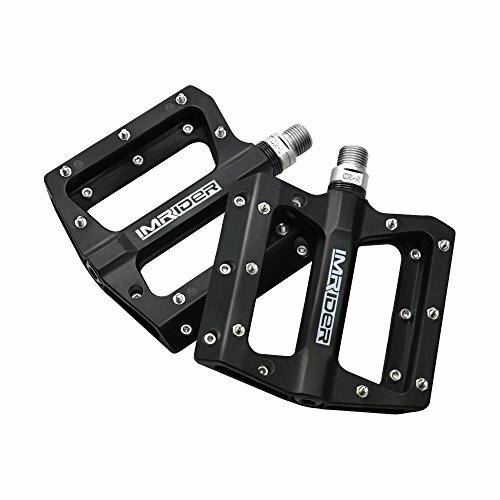 These pedals are easy to install, are durable and are very strong as they are created from hard-wearing aluminum alloy. Designed for just about any form of cycling activity, these lightweight but strong pedals are a striking, fun addition to any bike frame. Why We Like It – We like the Mzyrh 3 Bearings Mountain Bike Pedals because they’re so beneficial to the manner in which a cyclist using them can perform in terms of technique, speed, and safety. If you are struggling to choose between flat or clipless pedals, then look no further – perhaps there is no longer a need to choose one or the other! These flat mountain bike pedals offer the possibility of having both and are the answer you’ve been seeking. The Shimano PD-M530 pedals are smaller than the average pedals, great for cyclists who travel with their bikes perhaps for races across the country or even the world. These aesthetically pleasing, black and silver standard SPD cleat pedals also have some platform for the rider’s shoe to grab on to, adding to their gripping ability, power efficiency, and increasing the safety while riding. They are another lightweight option of the pedal at 455g and are easy to fit the majority of bikes through the use of Philip’s screwdriver which will also help the cyclist adjust the pedals to their exacting standards with very little difficulty or fuss. Why We Like It – We like the SHIMANO PD-M530 Mountain Pedals because they help cyclists get the best of both worlds while not having to decide between the benefits of flat or clipless pedals. Available in silver, white and black, these small pedals are ideal for use by regular mountain bikers or road cyclists. They are sold as click pedals and are impressively lightweight at 380g; the perfect solution if you do not want to add too much weight to your bike for fear it might slow you down. See more road bike pedals here. They are a very reliable type of pedal and have been proven to increase performance capabilities. They may be compact, but they are mighty. Their design is faultless, they are easy to fit your bike, and they can be altered in their tension settings to suit your exact requirements. Their spindle is created from Chrome-moly, and they have very low maintenance sealed bearing cartridge axle which prevents them from getting clogged with dirt. Cleats are included when you purchase these pedals, and we guarantee that you will not be disappointed in their performance. Why We Like It – We like the SHIMANO SPD Pedal Clipless Pedals because they give you the ability to increase the tension of your ride which in turn increases the power, muscle, and fitness. 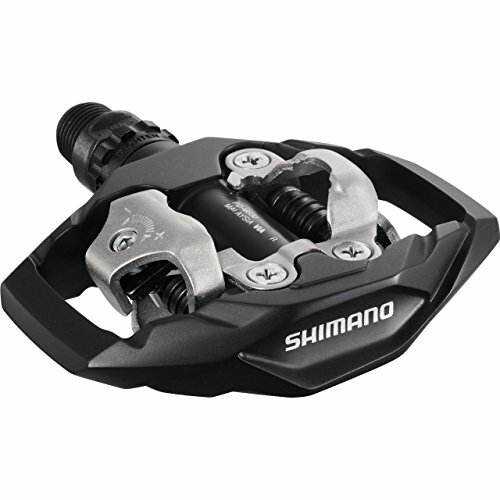 Interestingly shaped, these Shimano PD-GR500 pedals have been created with a concave platform to encourage greater control from the rider and increase the efficiency of the power provided by the pedals. They are extra wide pedals allowing the rider a better, firmer and safer grip, while also remaining very low profile. They are available in silver and black for you to choose from. Alter the pin heights to one of three different height settings suitable to you, your shoes and your activity. The axel has been created in an extra strong manner to avoid the worry of it snapping when excessive pressure is applied during tough cycle climbs, and replacement pins are available should you require them. The pins are inserted from the back of the pedal so that any maintenance necessary is much easier for you to access, also ensuring that the footing is always well gripped and secure. 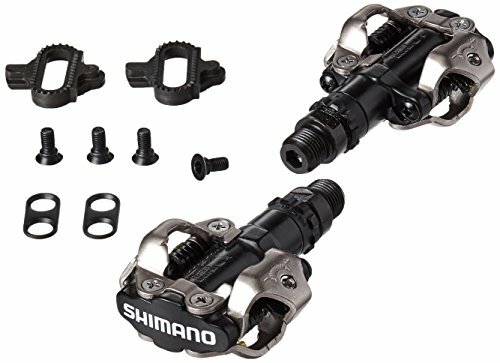 Why We Like It – We like the SHIMANO PD-GR500 Multi-Use Flat Mountain Bike Pedals because they are so solid and can be adjusted to suit you, your chosen activity and your specific pedal pressure. For a really easy to install, colorful pedal solution, this could be just what you’re after. These pedals are very smooth in their capabilities, have good grip and are incredibly durable, no matter what the cycling activity it is that you are undertaking. 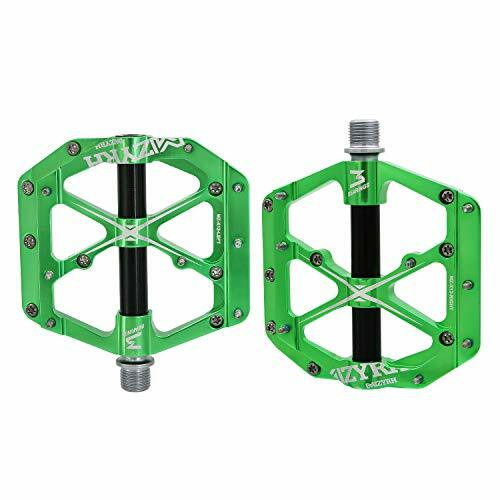 They have been created from a high strength aluminum alloy so that they are very strong but also to increase their durability and life span so that you do not have to worry about replacing your pedals again. They have a lubricated seal bearing and are of a universal size at 9/16 inch spindle. They have a dual-sided platform, and the pedals are composite. Their design is stylish, they are very lightweight, and they are able to fit easily on to the majority of bikes no matter what the cycling purpose, where you are wanting to ride or what conditions you may be faced with on your next biking journey. 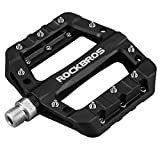 Why We Like It – We like the RockBros Mountain Bike Pedals Sealed bearing because of their strength, durability, and longevity. Not only do they look good and grip well, but they will also last a lifetime. If a hard spindle is what you are after then the Imrider pedal could be ideal as its hard spindles create ultimate grip and prevent any accidental slips from occurring even when the weather isn’t necessarily on your side. They have an anti-skid nail surface to aid with this, too, and have been designed with a larger platform shape promoting comfort for the rider along with pedal power efficiency. They have been created through the use of a high-quality polyamide making them resistant to abrasion and corrosion. They are easy to fit, both on adult and children’s bikes, as well as being suitable for a multitude of different cycling activities. They are available in four different colors, so there is definitely something to suit everyone. They weigh 11.2 ounces so will not detract from your speed either if you decide to purchase these pedals as part of your racing equipment. Why We Like It – We like the Imrider Lightweight Polyamide Bike Pedals because they are safety conscious, ensuring that the cyclist does not skid, slip or slide even when the pedals are wet or muddy. These Shimano pedals are so dynamic that they can be used on any bike, any activity and in any circumstance. They aren’t hindered by shoe type and have been designed with efficiency in mind. These pedals suit all shoe widths with efficiency remaining high. The pedal and outsole have been integrated for easier use enabling better power to transfer from rider to bike. Shimano pedals increase performance levels and rider control. With Shimano pedals, the cyclists can pedal with greater efficiency, gain more speed and is safer, more stable and comfortable in their riding journey. The mud-shedding design prevents dirt from clogging the pedals, flushing the pedals when the rider initially makes contact, making pedals safer, increasing grip and remaining in control. Due to this, specific cycling footwear does not have to be worn on every occasion. 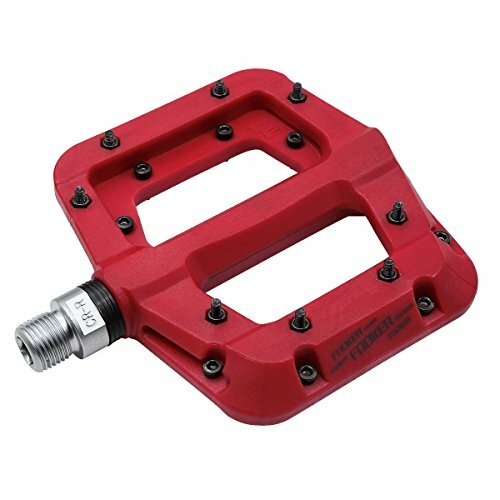 These industrial looking pedals are well designed, heavy duty and lightweight at 568g. Why We Like It – We like the SHIMANO PD-M324 Clipless/Clip Pedals because they are able to prevent mud from clogging the pedals with no intervention required, creating a safer, more stable and more controlled cycle. A super thin, light pedal option is the Bonmixc pedal. They have an 11mm profile and are just 335g. Created through the use of an aluminum cage body and sturdy axel, they are fairly durable and will help you to put a lot of miles on the clock. 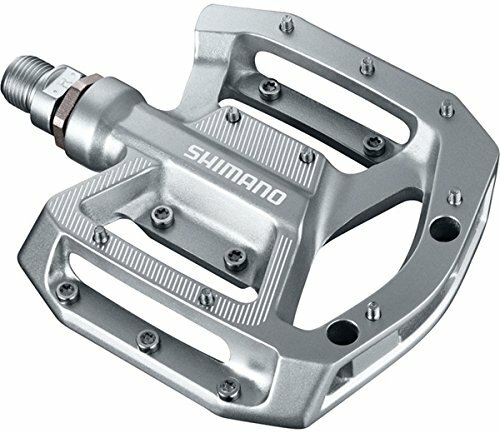 If you’re a cyclist who is not particularly aggressive in technique, these pedals are a viable option. They are good for gripping on to the sole of the cyclist’s footwear and are attractive to the eye if aesthetics play an important part in your decision. These pedals are 9/16 inches and are impressively cost-effective. 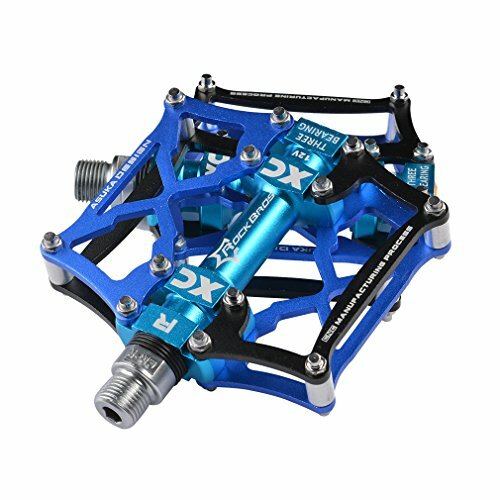 Created from high strength aluminum alloy and with four sealed bearings, these pedals are available in a range of colors, including black, blue, red, and titanium, and come with anti-slip nails. Bonmixc may be a relative newcomer to the cycling world, but they are certainly a brand to watch. 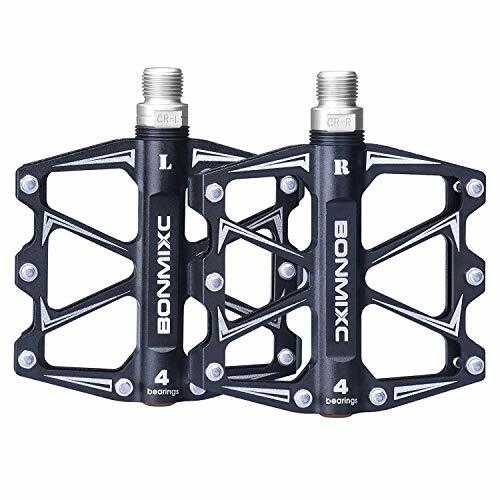 Why We Like It – We like the BONMIXC Mountain Bike Pedals because they look good, perform well, and are safety conscious. They grip to shoes effectively and aid in performance, speed, grip, and fitness. When you are looking to purchase new pedals for your mountain bike, there are multiple things that you should bear in mind. After all, you aren’t going to get very far without pedals! The pedals are what transfer the power from your legs into the energy to run your bike, so the pedals must be right. Buying the wrong pedals can be costly, dangerous and frustrating, but all of these things can be avoided if you take note of our top tips. So what are the most important things to consider before you make a purchase? If you are going to be mountain biking, you need to think about multiple different elements, such as hills, traction, slipping, grip, and weather conditions. It is paramount that you keep safety at the forefront of your mind. You do not want to cause yourself an injury which could easily have been avoided. This may seem like one of the biggest questions when it comes to choosing your new pedals, but actually, it is probably a lot more straight forward than you think. If you use your bike purely as a mode of transport, then a flat pedal is the better pedal type for you. If you go off-roading, mountain biking, or racing, then a clipless pedal would be a better option. If you, for instance, cycle to work but also want to be able to go for an adrenaline based bike ride at the weekend, then you may want to consider touring pedals. If you are wanting to cycle at speed, then you must consider the weight. It probably seems obvious, but the lighter the bike and the equipment, the better the speed which can be obtained by the rider. This point is often overlooked. This also applies for stopping distances and breaking speeds, the less weight you have to stop the faster you bike will come to a standstill, especially if gravity is pulling at you if you are downhill mountain biking. There will be times, perhaps very frequently, when pedals must be detached and reattached to your mountain bike. When this is the case, you do not want to be wasting precious cycling time finding ways to attach them, requiring lots of different tools for the job and being really fiddly. Ease the attachment process as best you can by looking specifically for easily attachable pedals. These are a must have for riders who frequently travel or for people who change the use of their bike. Life is stressful enough – make things are simple as you possibly can! Strangely, this is actually more important to a lot of cyclists than you may think. For some people they want their pedals to blend in with the rest of their bike so that the transition between frame and pedal is not at all noticeable. But for other people, they feel that their bikes are an extension of their own personalities. They want their bikes to function well, but also to be fun, bright and colorful. Whichever category you fit into there are pedals perfect for you. There are single color pedals, in dark or brighter colors, or there are much more jazzy pedals with multiple colors and patterns on them. Take your pick – there are so many different combinations to choose from. It is still very common for flat pedals to be favored, mainly because they are easy to attach and are very practical in their uses. It is a common misconception that they limit performance capabilities, though this is actually not the case. In fact, for people who ride in specific manners, like cyclists who favor downhill mountain biking, there is actually no better pedal type. This is because they allow both the bike and the rider to perform well, the power between cyclist and bike is transferred well, there is plenty of freedom with a flat pedal, the feet are not restricted in any way, and flat pedals provide the greatest amount of adaptability of any pedal. Flat pedals are also beneficial because they can be used on bikes when specific cycling footwear is not being worn, and this will not be of detriment to bike, rider, power, performance or safety. Yes, they certainly can be. If you do not want to go to the expense of buying cycling shoes, then clipless pedals are a great way to gain power and efficiency without adding to the cost of your cycling gear. What is the advantage of buying touring pedals? Touring pedals are the preferred pedal type for people who want to use their bike in multiple different capacities. This usually refers to people who use their bikes in the week as their transport, helping them to avoid the traffic and to maintain their fitness through the week, but at the weekend they want to go for an off-road, mountain bike session. If this is the case for you then touring pedals are useful because they are larger pedals so you can use cycling shoes or normal footwear, like trainers or work shoes, and they have the added bonus of having a cleat system if/when you require it. Is there a reason for having colored pedals? It is generally just a personal preference as to whether you would like pedals that blend in with the color of the rest of your bike, or whether you would like pedals which are bright and colorful. For some people, pedals are purely functional, for others they want function and fun. Alternatively, for some people having a brighter colored pedal is actually an advantage for safety. This can be helpful for people who cycle at night as it may help cars to see the cyclists more clearly when the light is fading, may help you to locate your bike if you have left it outside and could help you to identify other cyclists are a safe distance.